There are many guides to mixing all over the internet, YouTube, Amazon, etc – it can all be a little overwhelming if you’re a high school teacher wanting to do music technology/recording/mixing with your students. Where do you start? Well, if you have the time, in my opinion the best resource is the book Mixing Secrets for the Small Studio by Mike Senior. Of course there are many video tutorials on recording and mixing from Groove3.com and Askvideo.com as well as free guides on YouTube. But I’m going to assume you don’t have the time to dig deeply into those excellent resources and want to do something with your students fast. I’m not going to go into an overall picture of how to mix or get too deep, here is something I do with my year 10 and 11 students (14-15 year olds) that gets them going. If you don’t have a Digital Audio Workstation (DAW) then download Studio One Free from Presonus – it’s Mac and PC compatible (see my previous blog as to why I like this DAW). http://weathervanemusic.org/shakingthrough/episodes/hopalongNote, you’ll need to create a free membership to download files (highly recommended). Other excellent files you can download straight away are available from Mike Senior’s excellent website.If you’d like something more ‘orchestral’ in nature you can download these files composed by a student of mine (you can hear our final mix of it here). Drag and drop the audio files into Studio One or other DAW. First bring up the most important instrument (probably the lead vocals) to 0dB (or unity gain). 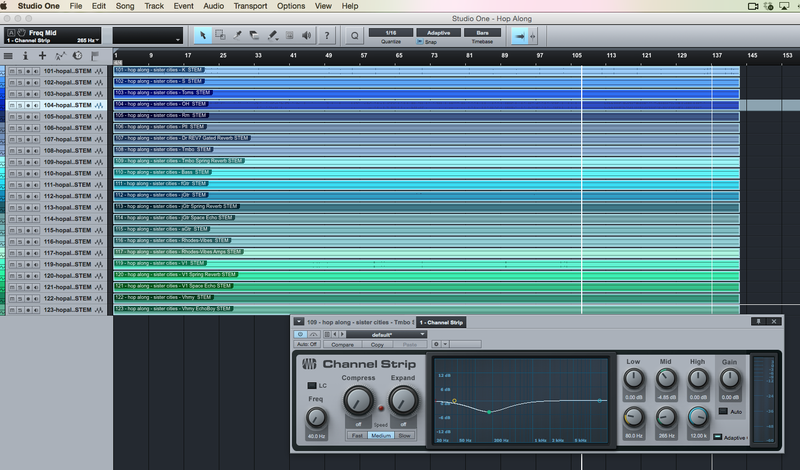 Then balance all other tracks in proportion so that you have a rough balance. If you’ve chosen the Hop Along track then you’ll probably do it in the order of: drums, bass, guitars, keys, BV’s, any other stuff. Pan the tracks. Leave the most important track (vocals) down the middle along with the kick drum, snare drum and bass guitar. Pan everything else to varying degrees left and right. You’ll now have a rough balance but things won’t quite be sitting nicely. Now put a ‘channel strip’ (or EQ if using another DAW) plugin on each track. You now need to cut and boost various frequency bands to take away the parts of the instrument sounds that are not important (such as mid range on a kick drum). Try stick to just cutting frequencies, don’t boost (as sometimes making something louder makes you think it’s better when it’s really not). By cutting ‘unnecessary’ sounds from some instruments you create space for other instruments to ‘breathe’. A good example is to cut mid-low frequencies from the kick drum to stop it from ‘competing’ with the bass guitar for the low end. As you adjust EQ don’t be afraid to go back and change your fader settings on the mixer or alter your panning. That’s it. Have your students do this with a bunch of different tracks from Shakingthough.com or Mike Senior’s excellent website. Those of you that know a lot about mixing will be (rightly) asking… “but what about compression, reverb, gating, special FX, etc, etc?”. Yes, those are important, but for teachers and students who are starting out mixing I think it’s best to leave it to what I’ve described above and for them to do at least 4-6 weeks on a few different sessions so they fully understand balancing faders, panning and EQ. I’ve deliberately avoided any theory around EQ, parametric EQ’s, filters, bandwidth and other EQ technical things. That can come later (and it’s all very important). For now, just use your ears, and have the class compare their mixes. Some students will be much better than others… use the strengths of those students to teach the others. If you would like more detail around the theory of EQ’ing (which is necessary for NZ students doing Unit Standards 27703 and 28007) you can order the relevant workbooks from Learning Ideas Ltd.